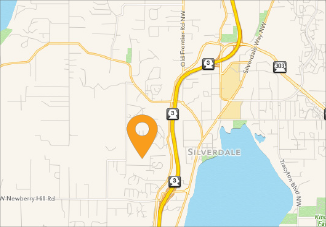 Do you care for outdoor community cats or have barn cats/working cats on your property? If so, you may be wondering about how your cats will do as we approach the cold, rainy season. Or maybe you have seen an outdoor cat around your neighborhood throughout the summer and are now considering bringing it to the shelter in order to keep it safe as we approach the winter months ahead. Rather than bringing an outdoor cat to the shelter this winter, you can help keep it safe and happy on your own property using our tips below! The first thing to think about when protecting outdoor cats from cold, wet weather is ensuring it has a place to stay warm and dry. If you already have a structure on your property where the cat likes to spend time, such as a barn, workshop, or garage, this structure may be adequate enough. 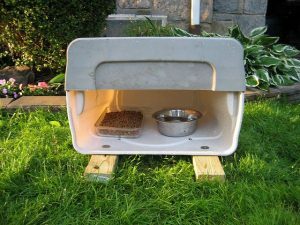 However, if you feel that the space isn’t warm enough, you can provide the cats with small enclosures within the barn where they can cozy up. This can be a cat carrier or crate, or even a cardboard box turned on its side. Using bedding and straw will ensure the cats have insulation and having small enclosures will allow their body heat to keep the space warm too! 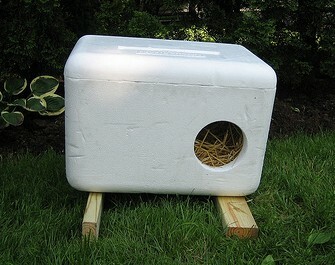 Another great option for creating a feral safe house is a utilizing a Rubbermaid bin. You can place a smaller Rubbermaid bin inside a larger Rubbermaid bin and then insulate the space by putting straw in between them. Cut holes in each bin (a few inches off the ground, and large enough for a cat to fit through) to allow the cat to go inside and place some extra straw inside the smaller bin to use as bedding. Check out this tutorial video by Kitten Lady. Lastly, you need to ensure that the cats water bowls don’t freeze in the cold weather. It’s a good idea to have a second structure (such as another Rubbermaid bin) to keep the cats food and water in. You can place straw or Styrofoam around the bowls to keep them insulated, or even purchase an insulated water bowl. It’s important to check the inside of the structure frequently to ensure it is dry and the cats haven’t knocked over their water dish. If the inside is wet, dry it well and replace the straw. Be sure to check the water at least twice a day and change it out frequently to prevent it from freezing. With these tips, you can help your own barn cats and community cats stay safe, warm, and dry throughout the winter months.